Brights, you’re definitely invited to this celebration of secular values! Twenty organizations are cosponsoring the event on the mall, March 24. The Brights’ Net is one of them. Why are so many groups cooperating in the Reason Rally Coalition? The aim is to spark a large secular gathering, hopefully the largest ever. By offering a free jamboree (music, comedy, great speakers, and lots of fun), there is hope that the buoyant event will unify, energize, and embolden more secular Americans. There will be lots of celebrities on the program, including internationally known atheist and Enthusiastic Bright, Richard Dawkins. Look for a finalized schedule at the Reason Rally web site. Our Reason Rally booth will emphasize the top reason for organizing as a constituency of Brights. We must more seriously work on a gaining representative participation within the civic realm, in business, government, education, etc..
We want to move forward on behalf of all citizens who have a worldview free of supernatural and mystical elements, however they may choose to identify with respect to religion. A “coming out” around the naturalistic worldview means a bit of “stepping out” as well -- out of the religion realm, and into civic pluralism in the American sense of equal citizenship. This will be the Brights' theme at the Reason Rally. The Brights’ Net will be tabling throughout the event on March 24. Be sure to stop by our booth in the “sponsors’ tent” sometime during the day (10 AM – 6 PM) and meet us! You can pick up some free swag, too (a static cling, patch, stickers, etc.). The 5-member Rally planning team has selected the Brights’ event theme, and Brights Central has produced a variety of free give-away items to emphasize it. Among the new items available is a Rally version of the popular "Brights bookmark". Meet some of the Brights who have volunteered to spend a shift at staffing the outreach table. So far, volunteers are coming California, Florida, Idaho, Massachusetts, Pennsylvania, Texas, and Virginia. You can discuss with them ways you might personally “step forward” to advance equality for citizens who have a naturalistic worldview. (It’s still not too late to volunteer if you email before March 10 to the-brights@the-brights.net with RRVOLUNTEER in your subject line). Even if unable to attend, you can order an item as a memento (the profits on advance purchases help to purchase more advance advertising of the celebration). An event DVD will be produced after March 24, including interviews with celebs as well as performances and speeches. That DVD can be ordered in advance, too. Primarily billed as an event that addresses American social circumstances, the Reason Rally is drawing supporters from elsewhere as well. Brights Central has received a handful of messages from Brights who are looking on from afar. It’s Going to Be Fun! Exciting! Awesome! Some have described the Reason Rally as an “atheist Woodstock.” The Brights’ Net, though, is supporting and attending the Rally for its stated purpose: to “celebrate secular values” (and to have fun). We hope attendees will visit the Brights’ booth! And we hope existing constituents will want to meet other Brights and get in on some Brights action. Brights Central is also hopeful that Rally participants will help to produce a family-friendly affair. Camp Quest, which was founded 15 years ago by a couple of Brights (Edwin and Helen Kagin), will be at the Rally with a range of children’s activities. This month, some participants in the Forums community finished organizing to send a brief letter of thanks to members of the Rhode Island State Council of Churches. It was in regard to a controversial court case that brought about removal of a prayer banner that had been displayed in a Cranston, RI, public school. Jessica Ahlquist, the student who had sought removal of the banner, had been the recipient of numerous uncivil responses. The letter thanked the RISCC for speaking out in defense of the student, and in favor of moderate dialogue. It was also endorsed by several international brights. Approximately mid-March, the Forums' informal Book Club hopes to begin discussing the book Bozo Sapiens: Why to Err is Human. If you care to participate, registration in the Forums is quick and easy, or, if you would simply like to follow along, pick up the related Topic and watch for news. As evidenced by the tiny “Humor” section on the website, there aren’t enough humorous books written by Brights. Everyone is just so serious! 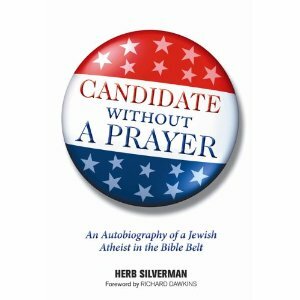 Consequently, get ready to be amused by one Bright’s story of trying to get elected in a “Bible Belt” state (South Carolina, USA). Running for election to public office in the American South, Herb had four very clear strikes against him. First, he was Jewish in Christian territory. Then too, Herb is most definitely a liberal while South Carolina is equally definitely a conservative state. (Many there still care deeply about the Civil War, but by birth and upbringing in Pennsylvania, Herb’s a Yankee and cares far more deeply about wars today.) And Herb has long been an atheist. But Herb - being Herb - ran for governor of the state anyway. Really. He did. Note: A more serious glimpse of Herb is provided in the Enthusiastic Brights section of the Brights’ website. Secular Americans come in many different stripes! This Reason Rally is an opportunity to showcase the diversity across many different “nontheistic” organizations in the Reason Rally Coalition! Let’s hope it can happen. Some Rally sponsors say the Rally is for “non-believers”. And, without doubt, many who will be drawn to the Reason Rally are quite happy to be viewed as such. In that sense, though, the Brights movement actually is rather nonconforming. Ours is a different thrust. In fact, Brights’ Executive Director Mynga Futrell, in her invitation to Brights to come and attend the Rally and step forward for civic equality, rejects the “nonbeliever” label entirely. For her, as for many constituent Brights, the narrow notion of “non-belief” just doesn’t fit. Having strong personal beliefs and values, she deems it incorrect. More to the point: she counts “non-belief” a religious concept, culturally imposed, and generally pejorative. For citizens who have a naturalistic worldview, opportunities for civic involvement and political influence are culturally limited. These citizens face religious stigma and marginalization. Moving toward the goal of civic fairness means garnering more social acceptance. We Brights must give others greater awareness of the naturalistic worldview overall. We need to be more candid about having supernatural-free perspectives. But when interacting with fellow citizens about our views, our terrain and methods clearly matter. Brights lack (but need) allies among those who hold different beliefs (all sorts of supers) in order to sustain secular governance. We are trying to build greater mutual understanding as we press for civic equality. 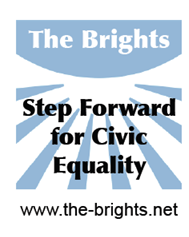 Consequently, citizens who have a naturalistic worldview will want to “Step Forward for Civic Equality” in ways that align with the aims of the Brights' movement.